All Photos by Ronald Cadiz Photography. 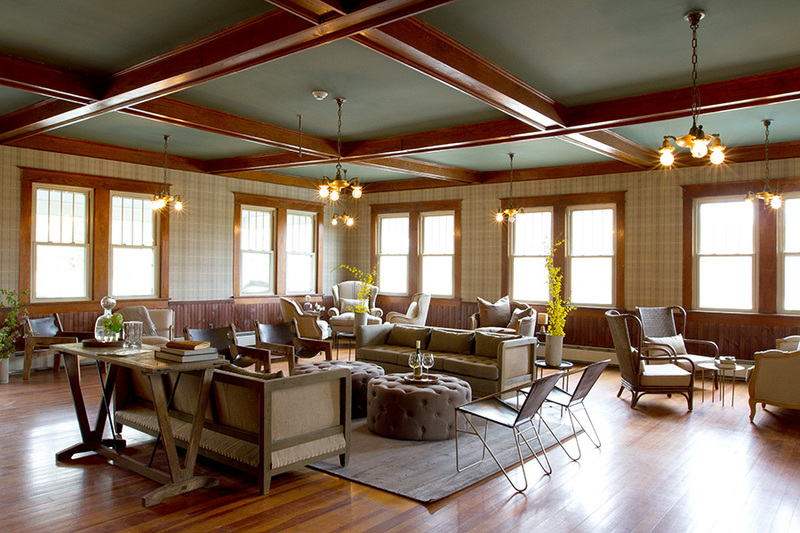 On a long weekend away from New York City, Popupla's Daniel Schwartz checked into the latest passion project of Sims Foster and Kirsten Harlow, the Livingston Manor residents behind Sullivan County favorites The Arnold House, North Branch Inn, and Nine River Road. It was a weekend to remember. 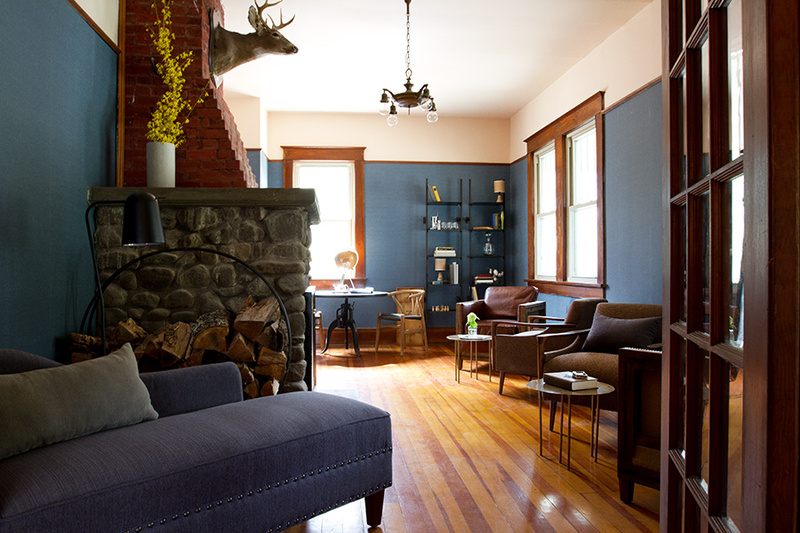 SULLIVAN COUNTY, New York – , a fourteen-room boutique that recently opened in a sleepy section of Sullivan County, is not an ordinary bed and breakfast. 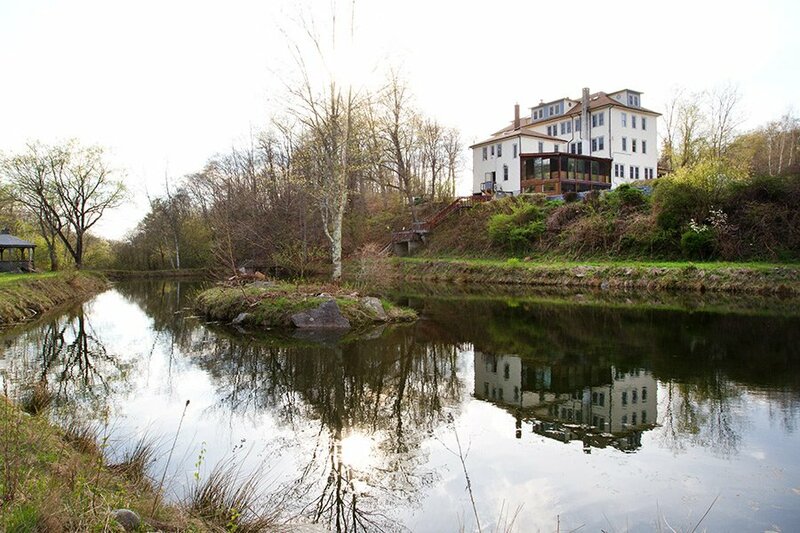 The refurbished inn, which dates from the 1880s, towers over 600 acres of private land, which includes an outdoor pool, two ponds, two mountains, and a famous fly fishing steam, the Willowemoc, running through it. To my girlfriend and I, both stressed and nature-starved urbanites, it was a dream weekend away from New York City. To Aksel Theilkuh, the man behind the hotel's ambitious, hyper-local food program, the impressive backyard is an opportunity to learn from nature. Throughout the week, Theilkuhl and his small team forage the mountains behind The Debruce, picking up ramps and mushrooms and underutilized herbs to complement the produce they grow in their garden and the proteins they source from farmers down the road. The goal is sustainability (a root cellar under the hotel helps foraged food weather the winter months) and showcasing the flavors of the Catskills. On weekends, dinner adopts an intentional flow, transitioning from a multiple-course introductory meal on Friday to a blowout, nine-course culinary experience (with optional wine pairing) on Saturday. Breakfast, a la carte and likewise exceptional, balances it all out. Favorites from the ever-changing menu when we visited — perfectly executed local trout and creamy mash; a breakfast popover with smoked freshwater eel, pickled ramps, and cream cheese; roasted green and white asparagus over a bed of aromatic smoking hay; and mountain crudite, an assortment of wild herbs you have to taste to understand. When we weren't nursing a food coma, we were out in the woods walking it off, in our room's clawfoot tub soaking it up, or by the fireplace with a drink from the downstairs bar and a book on fly fishing from the hotel's collection. We could have ventured farther afield on our long weekend in the Catskills, but having checked into a home so warm and welcoming, we preferred to concentrate our efforts on the beauty of our own backyard. Rates start at $399. .
Next to Willowemoc Creek, 20-minutes from Roscoe, ten minutes from Livingston Manor. 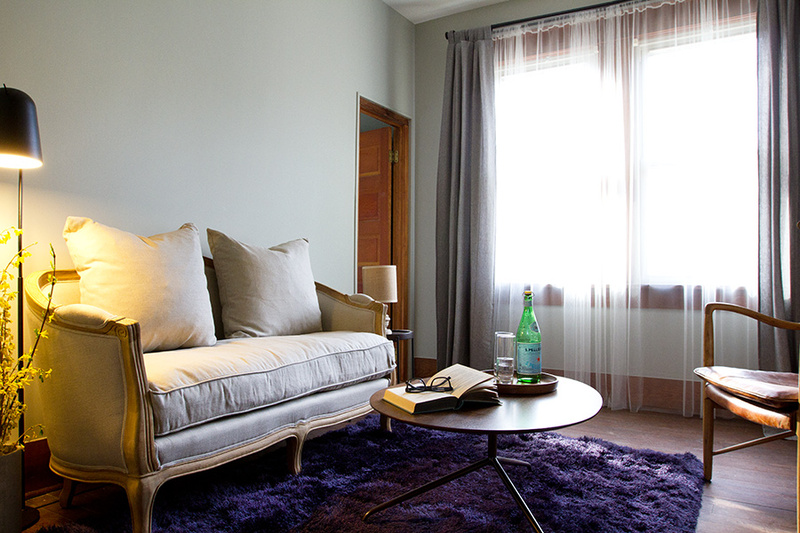 The country bed and breakfast of your dreams, designed with a touch of Brooklyn in mind. Couples who want a culinary experience on a carefree weekend in the great outdoors. Two gathering spaces, one with the building’s original light fixtures and the other with a fireplace made from 100-year-old local river stone, are filled with comfortable seating arrangements, games, and old books on fly fishing. A basement tackle room with assigned lockers stocked with fishing poles, waders, hiking boots, and skis provide a gateway between the hotel and the great outdoors. A small spa, an outdoor pool, two ponds, on-staff fishing guides, direct access to Willowemoc Creek, an expansive private trail system, foraging expeditions, and help arranging excursions (for canoeing, kayaking, rafting, skiing, snowshoeing) make it impossible to catch cabin fever. 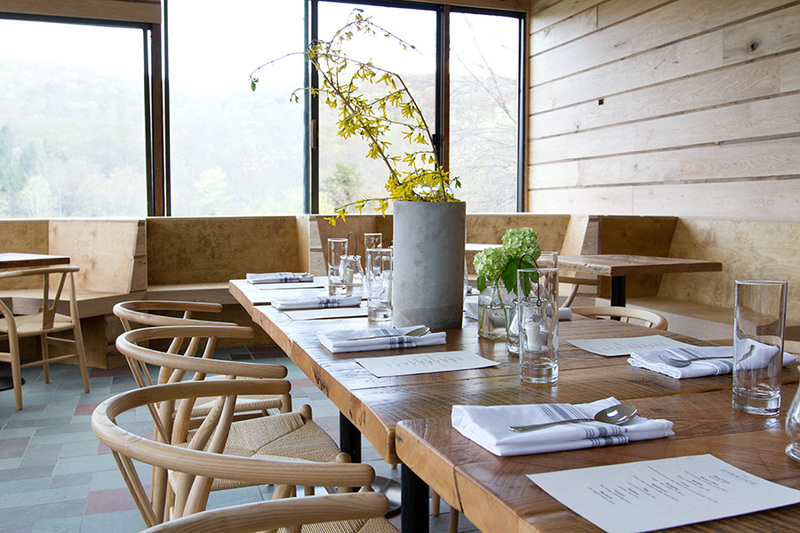 Chef Aksel Theilkuh, formerly of BLT in NYC, oversees breakfast and dinner at the hotel’s centerpiece 36-seat restaurant, which has butternut booths and hemlock tables and large windows that look out onto the valley below. A basement club house, with a fieldstone fireplace and salvaged flooring from defunct local hotels, serves beer, wine, and cocktails made with foraged ingredients (like juice from Japanese knotwood), as well as bar food for anyone who couldn’t snag a reservation upstairs. There are thirteen double rooms and one two-room suite, which features a parlor and an en-suite bathroom. 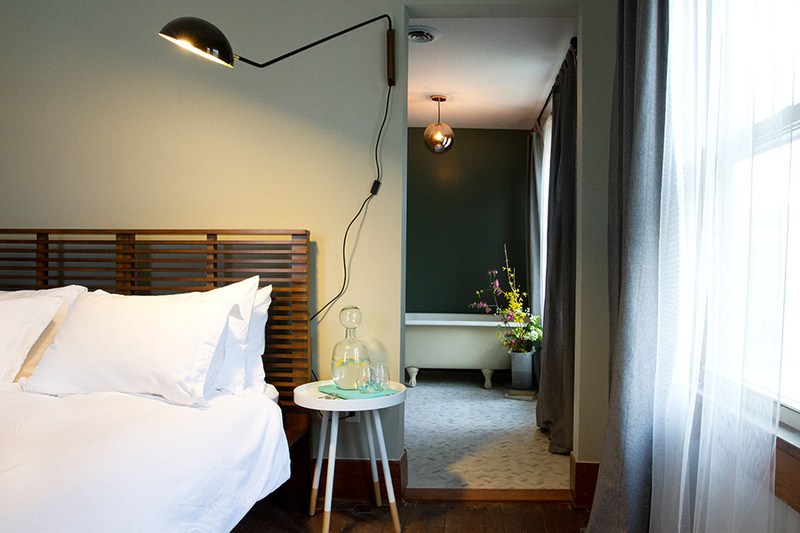 Bedrooms are designed in a clean and calming aesthetic with light fixtures made by local artists and elegant tiling in the bathroom. Some have clawfoot tubs in addition to showers, while others enjoy sweeping views of the hotel’s expansive property. WiFi is free and reliable, though stronger downstairs than in-room. There’s no mini-bar, just Saratoga bottled water and sweets waiting for you at check-in. Toiletries are by Malin & Goetz and bed linens are soft enough to double as clouds. Rooms aren’t soundproof. Checking for tics is important after hiking. And cell service is choppy, though that’s not necessarily a bad thing. The trail system, which will only grow over the coming years, is clearly carved out, though not too manicured. Forest bathing — alone, with the chef, or with naturalist Laura Silverman of The Outside Institute — is a real thing, and one of my favorite ways to spend time in the great outdoors. The pool overlooking the expansive grounds. If you’re hungry and the hotel isn’t serving food, get lunch at in Livingston Manor and shop their grocery section before heading back to the city. If you’re looking for souvenirs, grab a growler from nearby or a bottle of something stronger from Roscoe’s , or keep your eyes out for the many antique shops and yard sales that lines the local roads. If you’re an experienced fly fisher, you already know about the famous waters of the Willowemoc and the Beaverkill. If you’re just starting off, take a lesson at the hotel and touch up on local history at the . If you’re in the mood for even more hiking, ask the front desk for a trail map of the Willowemoc Wild Forest nearby. That said, there’s really no reason to leave The Debruce. Drive three hours north from New York City. You’ll need your car if you decide to leave the property. Whenever the mood strikes. There’s something to do all year round.